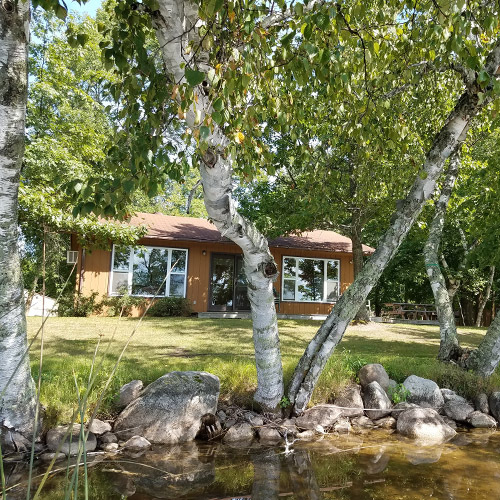 Situated closer to the Lodge, yet still private, this cabin has a wrap-around deck and lovely views to the South over the bay. It offers two bedrooms (one king or twin separates, two twins), a sleeper sofa and ¾ bath. Each comfortable cabin offers privacy and modern amenities and is fully-furnished, including bedding, cooking and eating utensils, air-conditioning, charcoal grill, a private dock and boat, picnic table and fire pit. Guests are asked to bring their own towels. There is a boat launch, and motor and pontoon rentals are available. A laundry facility is available for guest use.